Moving around in The Sims 3 is much easier than in previous versions. 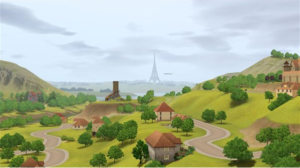 You can play as more than one family by changing your active household, and even create new games in different towns, or in the same Sims 3 neighborhood. This guide will explain how do you move your sims 3 from one house to another, and also the new options for Sims 3 real estate that is offered through The Sims 3 Ambitions. If you were wondering how do you move your Sims 3 from one house to another, it is actually quite simple to do in The Sims 3. To move your active household to another household, the house that you want to move your Sims to must be unoccupied. To move your Sims to this vacant house, an adult Sim must use their phone or use a computer and select “Move.” Then you must select the “House” option and then pick out your new house. Be sure to have enough money to purchase the house (the Sims 3 money cheat helps with this). You also now have the option of either selling your current household belongings or packing it up and taking it with you. If you decide to pack it up, all of the inventory will be moved to your active household’s family inventory. After your new house is purchased and your Sims are at the new house, the Build Mode is brought up for you to place or decorate your Sim’s home and change items as you wish. Occasionally, a challenge will also become available when moving your Sims. One of the great new options that became available in The Sims 3: Ambitions is the addition of The Sims 3 Real Estate. Sims in your neighborhood are now able to purchase community lots that generates revenue for your Sim’s family. When a Sim purchases the community lot building, they also have the option of upgrading it. Profits earned through real estate investments become available each Monday at 9AM. These profits are not directly deposited to the family’s account (like the weekly stipend on professions). Instead, your Sim needs to go collect the money at the place of business. Strangely, even if your Sim is working at the place of business that they own, their career is not affected. Also, Sims that have a romantic relationship with an employee at their new place of business will now become “Creeped Out” by their boss when attempting romantic interactions.